The 6ft cable allows the input device to directly connect to the display with fully transmission rates for perfect audio and video. Resolutions up to 1080p are supported for high definition clarity. Uncompressed digital audio is also supported on the same cable, for an all-in-one experience. 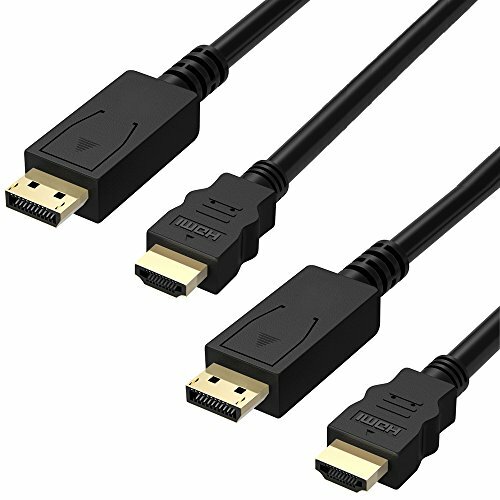 VGA and DVI displays are compatible with this cable, as long as the correct adapter is used (not included). The Underwriters Laboratories (UL) is an internationally known safety organization that specializes in approving new technologies by ensuring they meet certain standards for safety and performance. This cable is Recognized by the UL (20276). Note: This is not a bi-directional cable. This cable will only transmit audio and video from the DisplayPort end to the HDMI end. Your Fosmon product is included with a limited lifetime warranty. Please visit our Fosmon website for more details. If you have any questions about this product by Fosmon, contact us by completing and submitting the form below. If you are looking for a specif part number, please include it with your message.